Doing good for the environment improves well-being. Tania Schusler, is an Advanced Lecturer at Loyola University Chicago’s Institute of Environmental Sustainability and a Public Voices Greenhouse Fellow through The OpEd Project. 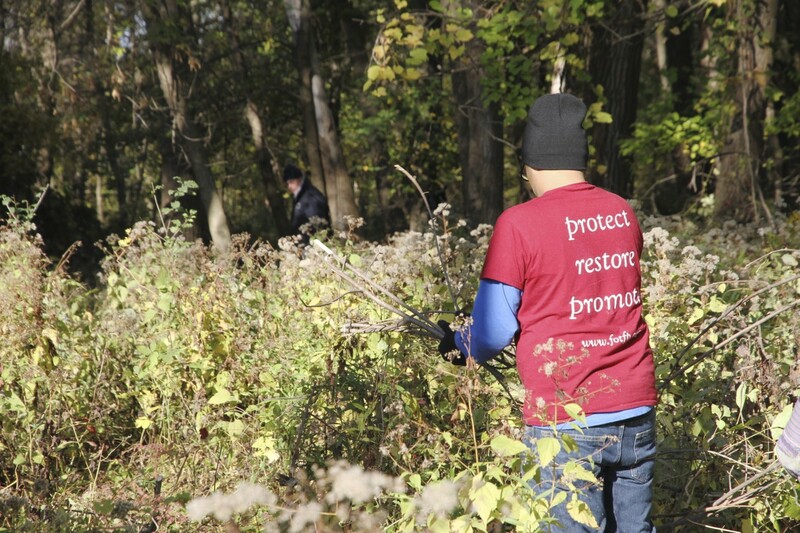 The Chicago Conservation Leadership Corps restores an oak savanna. Photo by Alex Russ. The budget and future of the Environmental Protection Agency is in peril despite a recent Reuters poll that over 60 percent of Americans would like to see EPA’s powers preserved or strengthened. President Donald Trump’s administration would fare well to take the cue of locally-led efforts that restore ecosystems and enhance well-being. While actor and director Woody Allen once famously remarked, “I’m at two with nature,” no one can afford such a dismissive attitude anymore. In Chicago, Eden Place Nature Center transformed an illegal dump site into an urban oasis. The Friends of the Forest Preserves Conservation Corps provides jobs and volunteer opportunities restoring the region’s woods and prairies. Volunteers alongside staff of land management agencies collect prairie seeds, remove invasive species, and plant native tree seedlings. They also re-introduce ecological processes, such as carefully controlled fire, that help native plants and the animals dependent on them to flourish. Their efforts not only increase habitat for other organisms but also provide humans with benefits like reduced urban flooding (because vegetation captures stormwater that runs off pavement) and associated economic costs. At the recent closing celebration of the 6th Annual One Earth Film Festival, attendees experienced the Amazon in the virtual reality film Under the Canopy. Nature’s mesmerizing diversity of organisms also can be found closer to home. Just two miles east of downtown Miami at Virginia Key, a barrier island degraded by dumped dredging materials, volunteers planted 11,000 mangrove seedlings and 35,000 other plants to stabilize beach dunes where loggerhead turtles nest. The Billion Oyster Project is restoring this cultural and culinary icon to New York Harbor. Gathering would-be discarded oyster shells from restaurants and preparing them to grow new oysters, they have re-introduced over 17 million oysters towards their goal of one billion. The oysters in turn filter water, improving the harbor’s water quality. Such efforts to heal the environment also benefit personal well-being. Studies document that exposure to nature reduces stress, improves cognitive functioning in adults and children, prevents depression, and leads to better mental health. Researchers at the University of Illinois found that trees and grasses in urban environments increase neighborhood vitality because more social interaction occurs in vegetated than barren spaces. My own research shows that in Chicago more tree canopy correlates with less crime — similar to findings of studies in Philadelphia, Baltimore, and New Haven. When people come together to care for lands or waters through habitat restoration, community gardens, urban forestry, and related practices, they improve both ecosystems and their own physical, psychological and social health. Cornell University researchers Marianne Krasny and Keith Tidball refer to these efforts as “civic ecology” because they integrate social and ecological well-being. To be sure, the scale of civic ecology practices are small in comparison to the magnitude of environmental degradation and destruction, especially as the Trump administration rolls back environmental protections. Yet, they show that people can do good for the environment and at the same time enhance their own well-being. The common idea that actions positive for the environment necessitate discomfort, costs, or sacrifice is a false dichotomy. As designer William McDonough and chemist Michael Braungart contend in their book The Upcycle: Beyond Sustainability — Designing for Abundance, with intention and ingenuity, people can become a positive environmental force. Contact your local park district or land conservancy to learn how you can get involved in restoration efforts. Call your representatives in Congress to support EPA funding. Let them know that strong environmental protection makes for strong communities.